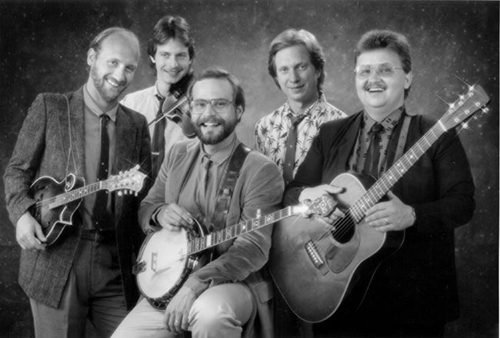 Alan O'Bryant had been working with a group called The Bluegrass Band — whose members included Butch Robbins (banjo), Ed Dye (bass), Dave Sebring (mandolin), and Blaine Sprouse (fiddle) — since the middle of 1982. With Butch on the banjo, Alan sang and played rhythm guitar with this band, but he itched to get his hands back on his 5-string full time. 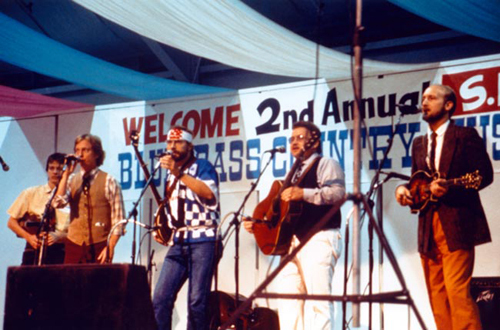 The Bluegrass Band had played several dates when they met Jeff Byrne, a music promoter who was in the early stages of putting together a 9,000 mile cross-country music tour. He expressed interest in having the group participate in the tour. However, by the time Byrne got the huge production locked in, The Bluegrass Band had split up. Alan called his friend Pat Enright and started talking about the possibility of putting a group together in time to do the tour. The two contacted mandolinist Mike Compton and bass player Mark Hembree, who had been working with Bill Monroe for the last five years. The four picked the name Nashville Bluegrass Band and signed on with the tour. 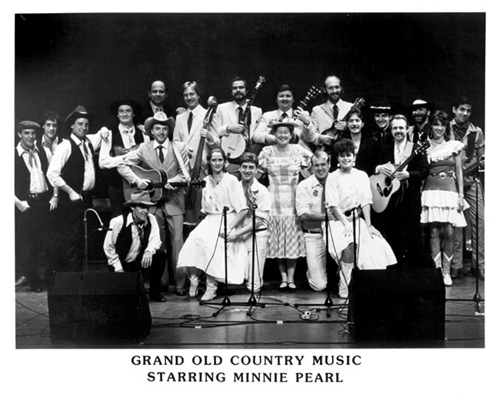 The Grand Old Country Music Show featured 22 performers including Boxcar Willie, Vernon Oxford, Minnie Pearl, Steve Young, the Pat Cannon Dancers, Mindy J and her Cyclone Rangers, the Cimarron Boys, and NBB. The entire entourage rode on a single bus for over two months, moving in a big circle across the U.S., sleeping in reclined seats. It was a long, grueling trip for everyone, but it gave the four bluegrass pickers a concentrated opportunity to develop a unique personal style. By the time they got back, they were a band. 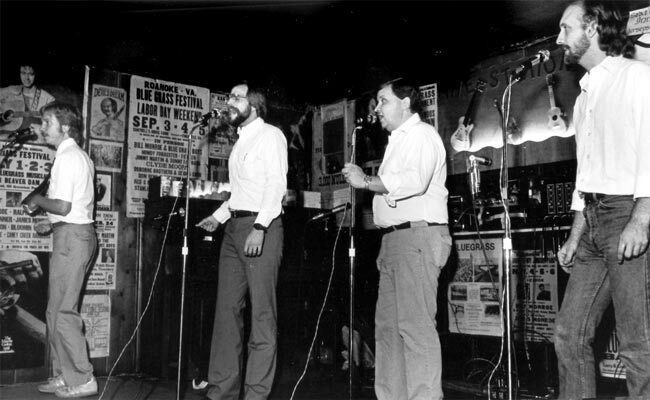 This photo was taken during an a cappella number at the first performance of the Nashville Bluegrass Band at the Station Inn on August 25, 1984. Left to right, Mark Hembree, Alan O'Bryant, Pat Enright and Mike Compton. Photo: Charmaine Lanham. The music that leapt forward from this union was a blend of blues, bluegrass and gospel music, tight harmonies and excellent musicianship. Pat’s former bandmate and friend Bela Fleck saw the band’s potential and approached Rounder Records about producing an NBB album. The resulting record, My Native Home, featured an appealing mixture of material with songs from Sister Rosetta Tharpe, the Carter Family, Bill Monroe, and Stoney Cooper. During production, they decided to add a fiddle to the tracks and called in Blaine Sprouse. 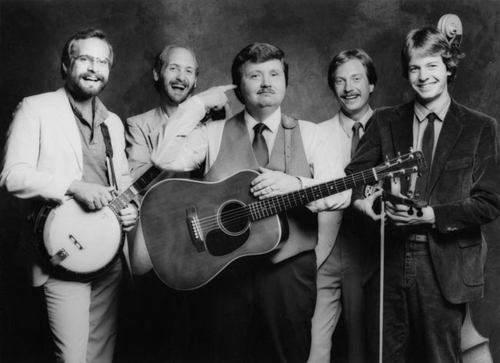 Rounder liked what they heard and offered the band a three-record contract. The boys really liked the fiddle in the mix and began talking about the possibility of adding another bandmember. They remembered a young fiddler they had met in Dayton, Ohio, who was playing in Larry Sparks' band. Stuart Duncan had spoken of his intention to move to Nashville and had asked if he could play any gigs with NBB, so Alan gave him a call. “We basically told him to throw his stuff in the back of the van and we’ll see what happens,” Alan recalls. Stuart officially joined the Nashville Bluegrass Band in the fall, just before My Native Home was released. At the beginning of 1986, O'Bryant met Keith Case, who had moved his booking agency to Nashville a couple years earlier. When Case heard NBB, he signed them immediately and has represented the band ever since. One of the first things he handled was NBB's trip to China. “There was this friend of a friend” who was working at the Sheraton Hotel in Beijing. At the time, the hotel was 80% American owned and was planning a nine day celebration called American Days which would end on the Fourth of July. 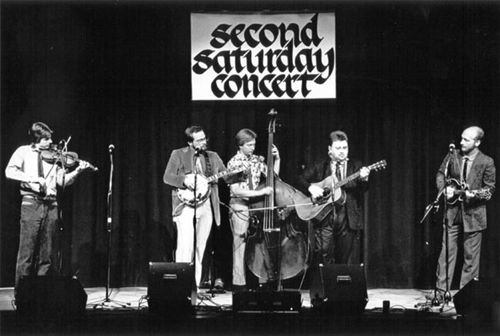 The boys were hired, along with the Harvard Glee Club, to entertain at the event, making NBB the first bluegrass band ever to play in China. Once there, the five were celebrities. “While we were in Beijing, we also played for the China Daily, the English-speaking newspaper there. They cheered everything we did and treated us like kings; it was one of the most memorable receptions we've ever had to this day,” O'Bryant recalls. The group had also slipped into Japan before their visit to China. They spent a week touring the country, playing at outdoor events and performing arts venues for foreign dignitaries and ambassadors. Enjoying the trip immensely, they would come back to Japan in 1989 and 1993. When the band returned from the Far East, Rounder released NBB's second vinyl album, Idle Time. Again produced by Bela Fleck, the album cover contained liner notes by John Hartford. 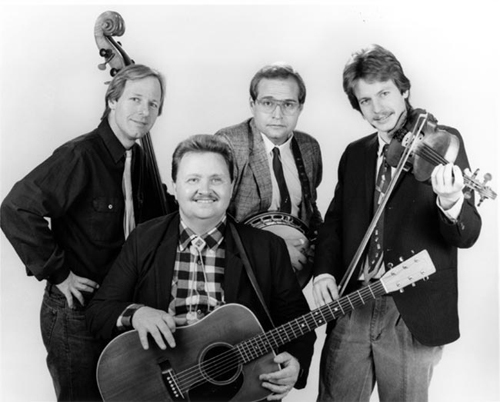 After its release, Rounder put together NBB's first Compact Disk, The Nashville Bluegrass Band, which would include four songs from My Native Home and most of the tunes from Idle Time. And the poetic words of Hartford. Touring got busier throughout 1987.“We were either in the car or in the studio all year,” Alan remembers. “During this time we continued to explore black gospel music as part of our presentation; we found a clear connection with traditional bluegrass music at the very core of black gospel harmonies,” O'Bryant said. The use of this type of music is now part of the Nashville Bluegrass Band's signature sound. This was the year Rounder released NBB's third recording, a bluegrass gospel album, To Be His Child, produced by Bela Fleck. The packaging included song annotations by traditional music historian Charles Wolfe. The CD cover is an old photograph they found in the Tennessee State Archives, hand-tinted by Alan's wife, Cathy. It’s the image of the Hermitage Church, where Andrew Jackson worshipped, circa 1910. “It took more time and money to create To Be His Child than any other album NBB has ever done — and it was well worth it,” said O'Bryant. The CD would become the most popular of all NBB recordings. • NBB received a GRAMMY nomination (the first year for bluegrass category for Best Bluegrass Album) for New Moon Rising with Peter Rowan; the CD featured NBB, Maura O'Connell and Jerry Douglas. • Alan O'Bryant received Platinum Album accolades as songwriter of Those Memories of You, which appeared on the Trio album recorded by Dolly Parton, Emmylou Harris and Linda Ronstadt. The song is now considered a bluegrass standard. 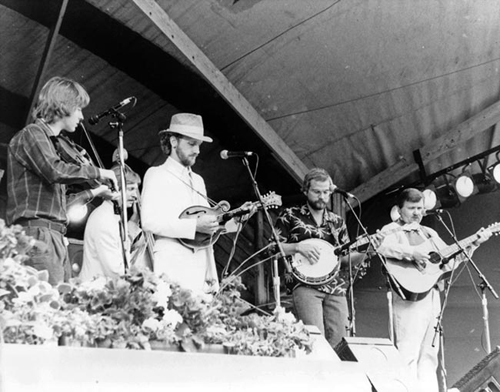 In April, the Nashville Bluegrass Band was asked to play at the first Merle Watson Memorial Festival, honoring Doc Watson's son Merle who had been performing with Doc for many years. Merle had died in a tractor accident the prior year at age 36. 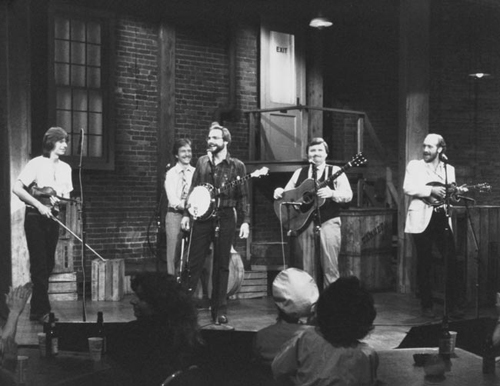 NBB has performed at every Merlefest since, always appearing on the Sunday morning gospel music show with Doc himself. Their next gig came about a week later, at the National Folk Festival in Lowell, Massachusetts. “We were all hurtin' so bad. We had to wheel Stuart through the airport in a wheelchair,” Alan remembered. “He could barely walk. Mark Hembree, who had been driving the bus at the time of the accident, was in serious condition and suffered multiple broken bones in his hand. An old friend of Stuart's, Nick Haney, came with us to fill in on bass.” It was a slow recovery. “He wrote us all personal letters of resignation,” Alan remembers. “We were so stunned, we couldn't do anything but respect his request.” Mike Compton quietly quit the music biz and moved to the Catskills. “We thought Mike was so completely un-replaceable, we’d never find anyone who could fill the bill,” Alan said, so they started to play gigs with four pieces. Then Haney, who had been doing a great job filling in on bass, was diagnosed with acute leukemia and the band was faced with finding a permanent bass player. “We had a West Coast tour coming up so we hired a friend of Stuart Duncan's who was living in out in California to play bass with us. He flew to Nashville to rehearse with us and we had a good feeling about him,” O'Bryant recalled. “Before the tour was over, we knew Gene Libbea was a keeper. I went to his home in Malibu to invite him to come with us full time. He was asleep on his couch when I literally showered him with cash, sprinkled him with dollar bills. He couldn't resist,” O'Bryant laughs. It turned out that Gene and his wife were interested in moving back East to Charlottesville, Virginia. He officially joined the Nashville Bluegrass Band in the spring of 1989. Meanwhile, “Word had gotten out that we were looking for a bass player,” recalled Alan. “Not knowing we had just hired Gene Libbea, Roland White called wondering if we still needed a bass player. 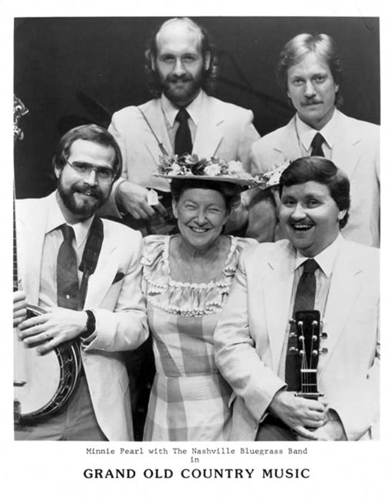 This presented NBB with the opportunity to work with one of their formative heroes and perhaps the greatest single influence on Mike Compton's approach to the mandolin other than Bill Monroe. Roland White was already a seasoned veteran and a Bluegrass legend." Roland joined the band the same time as Libbea. This configuration of the Nashville Bluegrass Band would last 12 years and would make the group one of the most recognized in bluegrass music history.